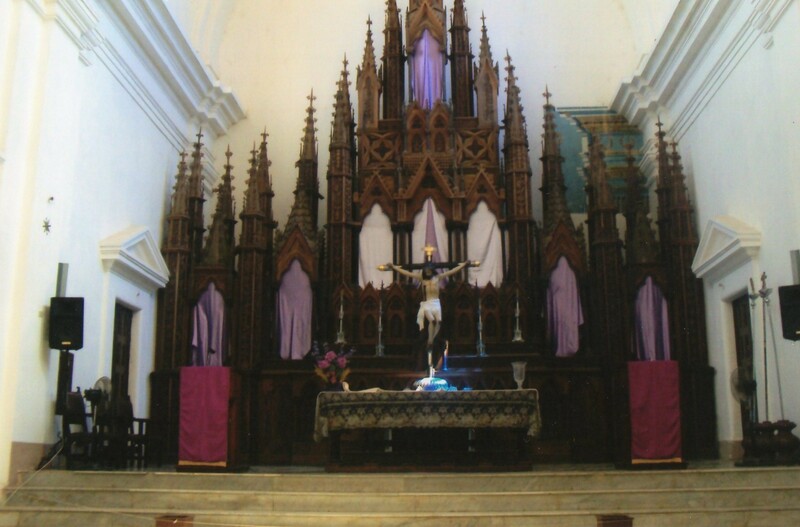 Covering statues in purple during the final stages of Lent is no longer common in Christian churches in the UK, but was practised in this Catholic church in Trinidad, Cuba, in 2014. The BBC Genome project is strange and wonderful. What possible scientific or cultural value can there be in endless lists of BBC programmes from the past? It seems aimed solely at weird folk like me who are keen to check their memories of childhood viewing habits. It did offer a source of evidence against which to test my theories about how BBC television’s coverage of Holy Week has withered during my life-time. When the UK still regarded herself more as a Christian country, and a church-going country, the national broadcaster screened far more religious material. Services each Sunday morning and Songs of Praise in a prime early-evening slot. Drama and documentary often dealing with religious themes, and especially during Holy Week. One Good Friday in the early 1970s I saw a fascinating documentary called According to the Rules. I needed BBC Genome to remind me of the title and the precise date (1972) but I remember vividly the impact it created. It concerned the libel case brought by a London doctor and ex-Auschwitz prisoner Wladislaw Dering against the writer Leon Uris in 1964, about allegations that he had carried out medical experiments on fellow prisoners. Making my early steps into adult fiction, I had just read Uris’ novel Exodus and been affected by his descriptions of Jewish suffering and heroism. A preview (possibly in the Sunday Times) had described the programme as “painfully relevant to Good Friday”. Few mainstream journalists would use the phrase today. Some years later, the BBC1 Play of the Month was rescheduled from mid-evening to tea-time on Easter Sunday for The Chester Mystery Plays. I remember at least part of Tom Courtenay’s performance as Jesus and it is intriguing to see now that the cast included some who later performed in Bill Bryden’s different stagings of The Mysteries : Brian Glover, Paul Copley, John Normington, Tony Haygarth. I wonder if this version played any part in the genesis of that great National Theatre long-runner. It would be good to see now how it compares. In the way that the craftsmen of medieval Mystery Plays adapted the Bible text into vernacular English which, in Bryden’s production, was brilliantly rendered by Tony Harrison, a translation into Scots was written by one William Laughton Lorimer. Bryden’s script for The Holy City in 1986 was based on Lorimer’s New Testament. This updating of the Passion to contemporary Glasgow had a great cast and some fine moments, and it would be interesting to see again now whether the strengths outweighed the flaws. One other feature of the 1980s on BBC1 was single-actor recountings of the story of Christ’s Passion day by day through Holy Week, filmed outdoors. This must surely have been inspired by Alec McCowen’s successful one-man theatre show of St Mark’s Gospel. I remember Tom Fleming, Peter Barkworth and Roger Rees, but had failed to notice that each year’s version used a different evangelist’s gospel. As these were short programmes, they were usually screened twice a day, mid-morning and last thing at night. 1987 looks like some sort of high-water mark. That Holy Week you could have seen on BBC1 both The Gospel According to St Luke presented by Bernard Hill and a nightly series called Music from the Masses featuring music from the Mass settings of composers like Berlioz, Brahams, Britten, Fauré and Mozart. On Good Friday itself between both channels were full performances of Verdi’s Requiem and Wagner’s Parsifal, a documentary about the Christian shrine of Walsingham and John Stainer’s oratorio The Crucifixion. Culture both high and Christian, and still able to be fitted alongside more mainstream fare like Neighbours, Wogan, The Clothes Show and Dallas. Into the 1990s, and Alec McCowen’s influence could be seen again in the multi-actor, casual-dress performance of The Gospels, with a script written by Giles Havergal. This had already been a Lenten success at the Glasgow Citizens’ Theatre in 1991, and the TV version worked equally well the next year, even with some higher-profile cast additions like Timothy West and Paul McGann. Holy Week dramas in subsequent years preferred to keep their connection to the New Testament a looser one, with two series of single-actor stories called Easter Stories and Easter Tales imagining the thoughts and experiences of characters like Judas Iscariot, Mary Magdalene, Barabbas, the gardener beside Jesus’ tomb and a serving girl. Alan Bennett’s Talking Heads was probably a model here. The BBC Genome confirms that for the second series the more secular original title of Tales from the Madhouse was modified. The classical music and opera inspired by the Passion story had always been a feature of Holy Week television, and some of this was still available on BBC2 in the 1990s. The fashionable young James McMillan introduced a programme of Arvo Pärt choral music on Good Friday 1993 and his own Seven Last Words from the Cross was broadcast each night of Holy Week the next year. On Good Friday in 1994 was Bach’s St Matthew Passion in a semi-dramatic version directed by Jonathan Miller, and in 1998 something similar was done with Poulenc’s Stabat Mater. In the 21st century, material relating to the Passion story continues on radio. Lent Talks has been a feature on Radio 4 for several years. Radio 3 always has appropriate music throughout Lent as well as the regular EBU day of Holy Week music, usually on Palm Sunday. Progressively less on TV, though. A religious service of some sort is still screened by BBC1 on Good Friday morning but other programmes on that day or elsewhere in Holy Week whose subject matter could be described as spiritual or sacred, like The Manchester Passion, are rare exceptions. Shifts in BBC practice in religious broadcasting have of course taken place alongside well-reported long-term reductions in Christian church attendance. For example, a drop in the proportion of the population who consider themselves Anglicans from 37% in 1986 to 20% in 2012. Nevertheless, these programmes, and others similar, are probably still sitting rejected on shelves or in computer files. Are they really only a memory from the past rather than a cultural resource for the present?